(Newser) – For more than a year, he had a nagging cough. Finally, the 47-year-old from the UK went to a clinic—and got the surprise of his life. The BBC reports that X-rays showed a spot on the man's lung, but it wasn't a tumor. It was a "long lost" toy traffic cone that had disappeared many decades earlier. 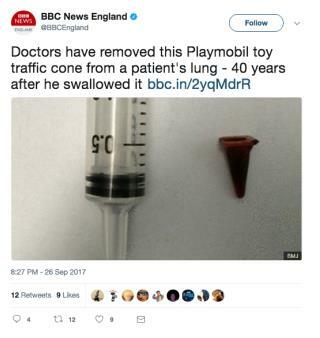 Part of a Playmobil set he got for his seventh birthday, the cone (less than a half-inch in length) had been inhaled by the youngster, then lodged in his lung, per the Guardian. The mailman "reported that he regularly played with and even swallowed pieces of Playmobil during his childhood," doctors wrote in BMJ Case Reports. But did he quit smoking or just swallowing Playmobil parts? There's a reason toys are labeled as not being suitable for young children because of small parts that can be a choking hazard. Playmobil sets are notorious for having tiny little parts. Of course, that doesn't stop kids from swallowing other things. My brother was flipping a quarter up in the air and catching it in his mouth... yes, you can guess the rest. My son swallowed a cricket on a dare.